Made from 130g 100% polyester high performance fabric, the SilverTech Polo is yarn-treated with both Cool Dryand a new nano-scale silver technology. This provides a long-lasting anti-bacterial and natural permanent de-odorised finish, keeping you fresh, clean and cool, however hard you’re working. The SilverTech Polo features horizontal silver stripes on the body with solid contrast fabric on the back of the collar, placket and edge of the placket, side splits. Ideal for sports, uniforms and corporate wear. 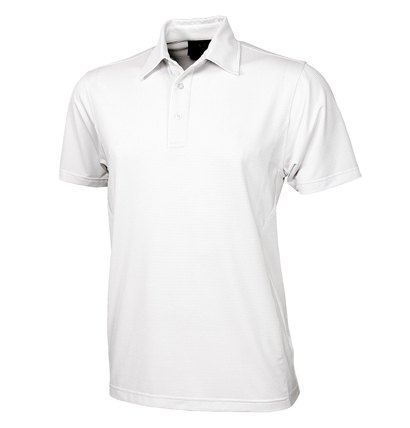 The Silvertech Mens Polo offers everything you could want in a promotional polo shirt. Made from 100% polyester high performance fabric, treated with both Cool Dry and nano-scale silver technology, this polo is comfortable, easy to wear, and keeps the body fresh and cool all day. The Silvertech offers plenty of features including anti-bacterial protection, deodorised treatment, quick dry, iron free, UPF rating of 50+ and availability in a range of sizes from small to 5XL. With all these features it’s a great branded polo for everyday business wear, and will also make a great promotional merchandise item. Available in a range of colours, the Silvertech Mens promotional polo has the option of either a screen printed or embroidered logo to help your business or brand stand out. For a great all over look or branding opportunity, team the Silvertech Mens promotional polo with the ladies version.